This is an alternative to surgery for the treatment of varicose veins. It is performed in the outpatient clinic as a walk-in/walk-out procedure and avoids the need for admission to hospital for an operation. Sclerotherapy works by injecting a chemical into the veins which causes them to collapse and fibrose. The use of ultrasound enables the vein to be visualised so that the sclerosant can be injected into the vein under direct vision. This ensures the sclerosant is injected directly into the vein and also provides information that the treatment is complete. Different strengths of sclerosant are used for different sized veins. Ultrasound guided foam sclerotherapy can treat obvious varicose veins as well as incompetent long and short saphenous veins causing underlying problems. This treatment is not usually painful and normally causes no discomfort, although sometimes a little aching is felt for a few minutes. Foam sclerotherapy is performed in the Outpatient clinic as a walk-in, walk-out procedure. You should attend wearing comfortable loose fitting clothes and shoes e.g. jogging trousers, loose skirt and trainers/slip on shoes. You will be asked to undress and lie on the treatment couch. The veins to be treated will be visualised with ultrasound and you will feel a number of pin-pricks as the veins are injected. Compression bandages and/or stockings are applied to the leg and you will be asked to dress and go immediately for a 10-15 minute walk. This is important to ensure that any foam that has entered the deep veins is quickly diluted and dispersed. After this walk you will be asked to sit in the waiting area for another 10- 15 minutes to ensure you have fully recovered from the procedure before travelling home. It is preferable to have someone available to drive you home after the procedure, but this can be discussed with Mr Michael Gaunt ahead of the treatment. How many sessions of treatment are required? With this technique, usually one leg is treated per session and if both legs are affected, treatment to the other leg is given a couple of weeks later. Once the treatment has been performed, its effectiveness is checked 3-4 weeks later when repeat or further treatment is often required. How will my legs look after the treatment? Some bruising can occur after the treatment but will settle down within a few weeks. Lumps can sometimes be felt underneath the skin when prominent veins have been treated, but these resolve slowly over a few months. Occasionally, pale brown discolouration appears over the skin when prominent veins have been treated which should gradually fade over time. Can I carry on as normal after the treatment? Following the injection treatment carried out in the outpatient clinic, you are able to walk normally and return to work. Walking is encouraged but it is best to avoid vigorous exercise for 1-2 weeks. As with all techniques of this type there is a small risk of deep vein thrombosis (<1%). For large veins near the skin, brown skin pigmentation is common and can take many months to fade. 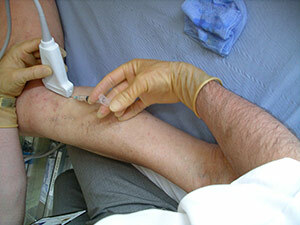 On rare occasions (<1%) foam can leak out of the vein and cause skin necrosis and ulcers. In such cases scarring can occur. In very rare cases small air bubbles in the foam can enter the arterial circulation and cause temporary visual disturbances, migraines or even mini-strokes. Patients with pre-existing migraine are at increased risk of this occurring. A follow-up appointment is required once a course of FOAM sclerotherapy has been completed.